Haul! New Products From… Revolution, Barry M, Bundle Monster, The Crème Shop, Treacle Moon, Montagne Jeunesse, CND, Superdrug & More! Hi there! Today’s post is about all the products I’ve bought over the past few weeks. 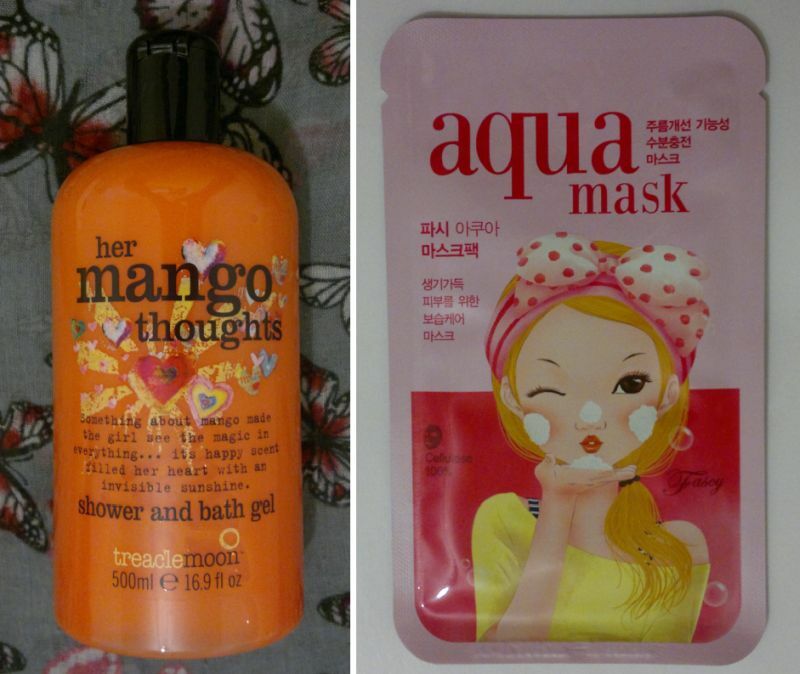 I picked up a lot of face masks, but I also bought toiletries, nail stuff and other skin care. The following goodies are mine now! The Crème Shop Clean Up, Skin set of 3 sheet masks for £4, TK Maxx. 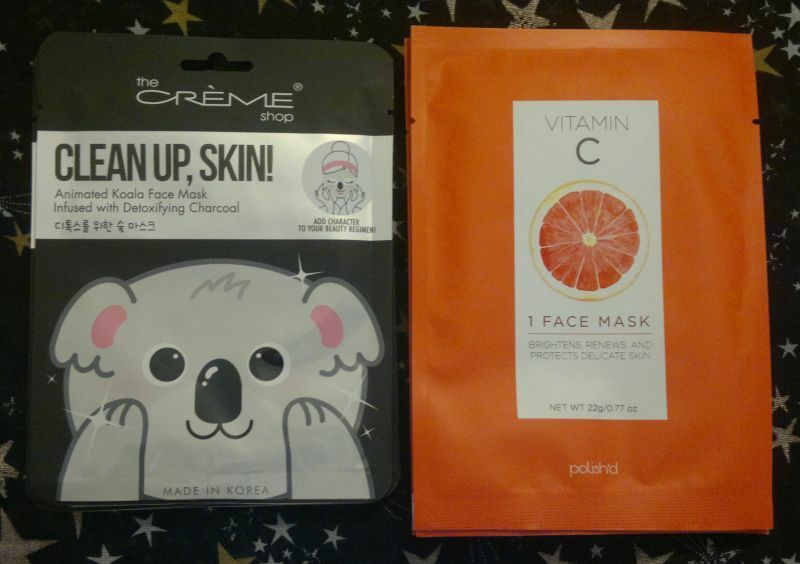 Polish’d Vitamin C Brightening Face Mask set of 5 sheet masks for £4.99, TK Maxx. 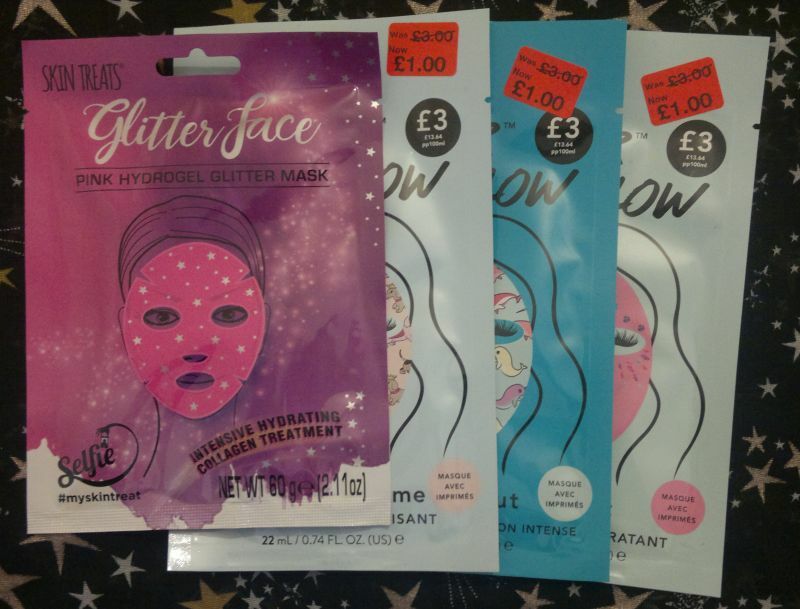 Skin Treats Glitter Face Pink Hydrogel Glitter Mask, £1 at B&M Bargains, 3 Holler And Glow Sheet Masks, £1 each at Primark. 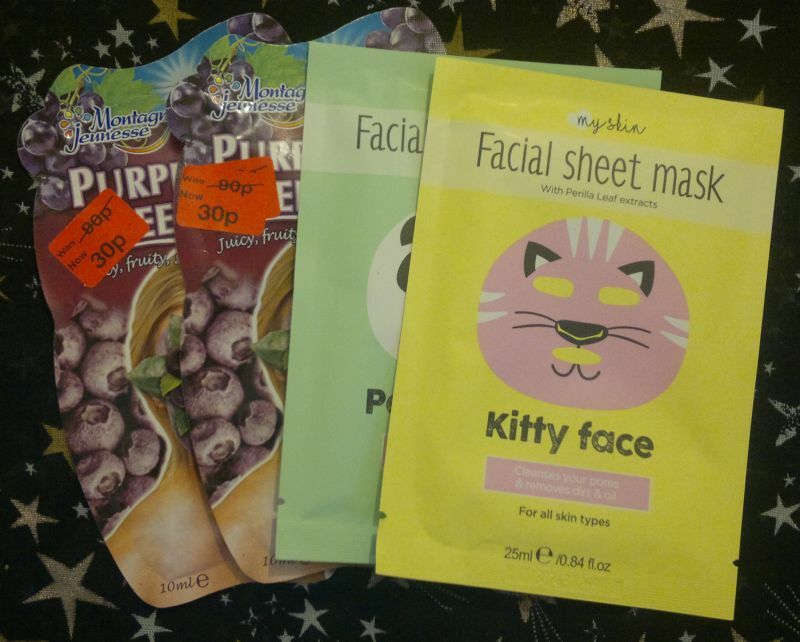 2 fantastic Montagne Jeunesse Purple Acai Peel Off Face Masks, 30p each at Primark, Maxbrands Panda Face and Kitty Face Sheet Mask, 2 for £1 (intro offer) from the independent bargain store (formerly Poundworld) in East Ham. 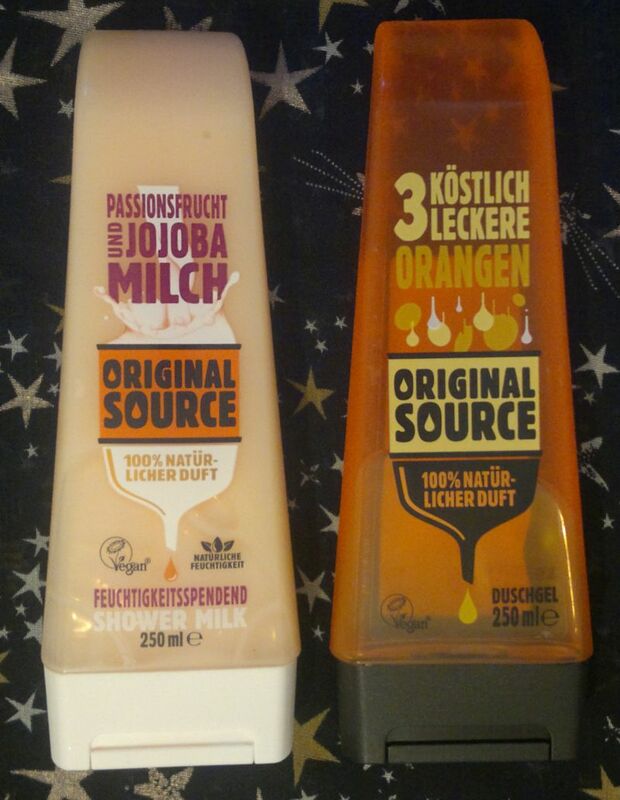 2 Original Source shower gels – 90p each from the independent bargain store (formerly Poundworld) in East Ham. 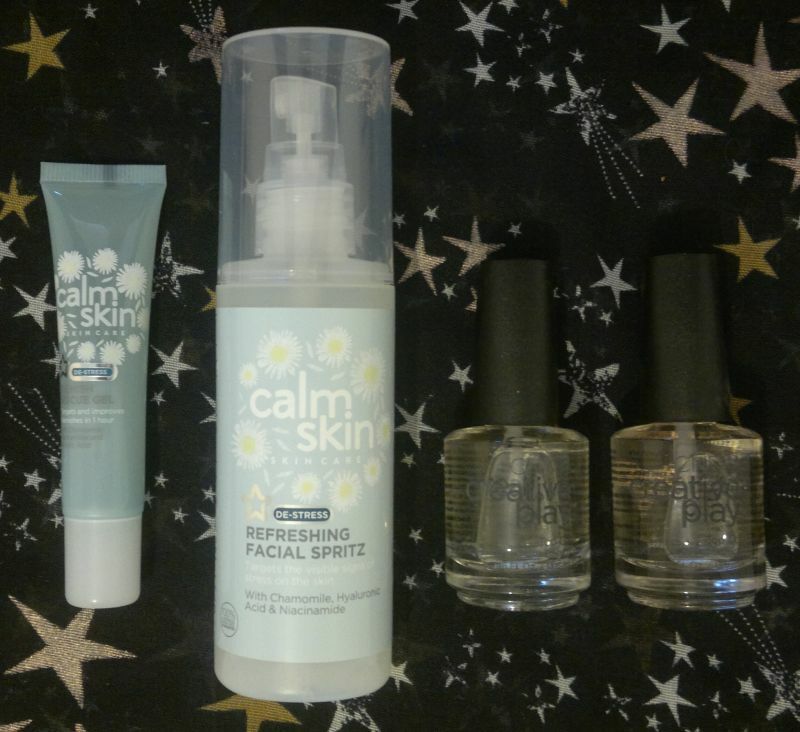 Superdrug Calm Skin Blemish Rescue Gel, Superdrug Calm Skin Refreshing Facial Spritz – these were £2.99 each but there was a Buy 1 Get 2nd Half Price offer. 2 CND Clear Top Coats – £1 each at Poundland. I bought 1 of these before, tried it, liked it, bought 2 more. The incredible Treacle Moon Happy Melon Sorbet 4x500ml, £2 each (save 1/3 offer) at Waitrose! Treacle Moon Her Mango Thoughts shower gel, £2 (save 1/3 offer) at Waitrose. Pack of 10 Fascy Aqua Sheet Masks, £5.99 at TK Maxx. 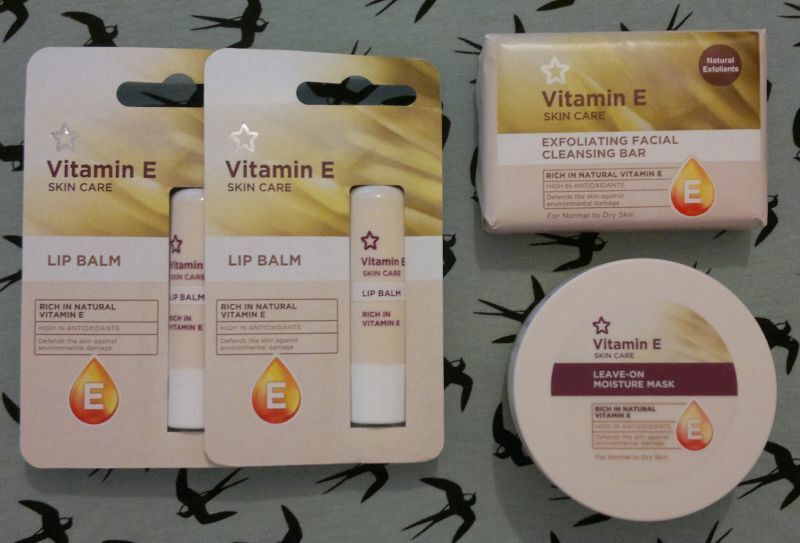 Superdrug Vitamin E products – 2 lip balms, £1.99 each but Buy 1 Get 2nd Half Price, the Facial Exfoliating Bar and the Vitamin E Leave On Moisture Mask were £2.99 each but also Buy 1 Get 2nd Half Price. 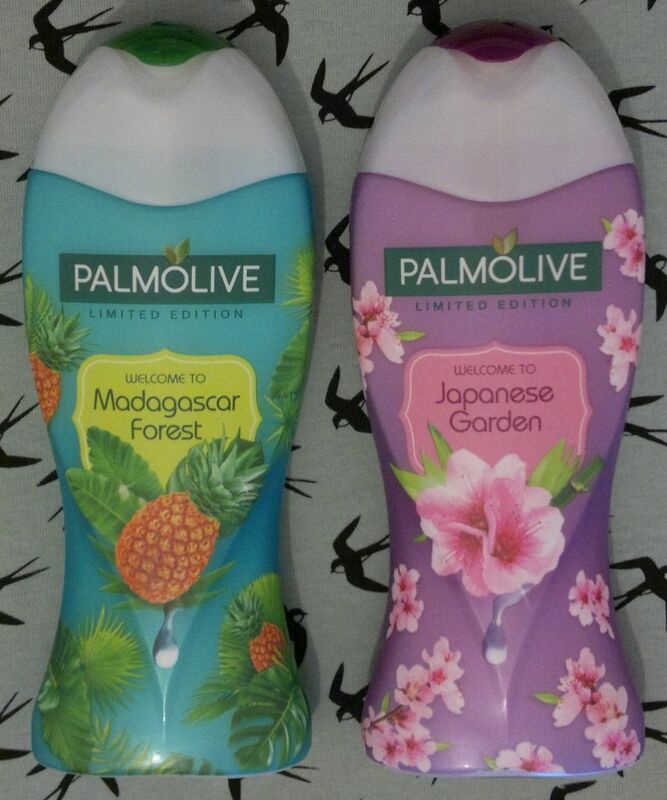 Palmolive Welcome To Madagascar Forest, Palmolive Welcome To Japanese Garden, £1 each, Superdrug. 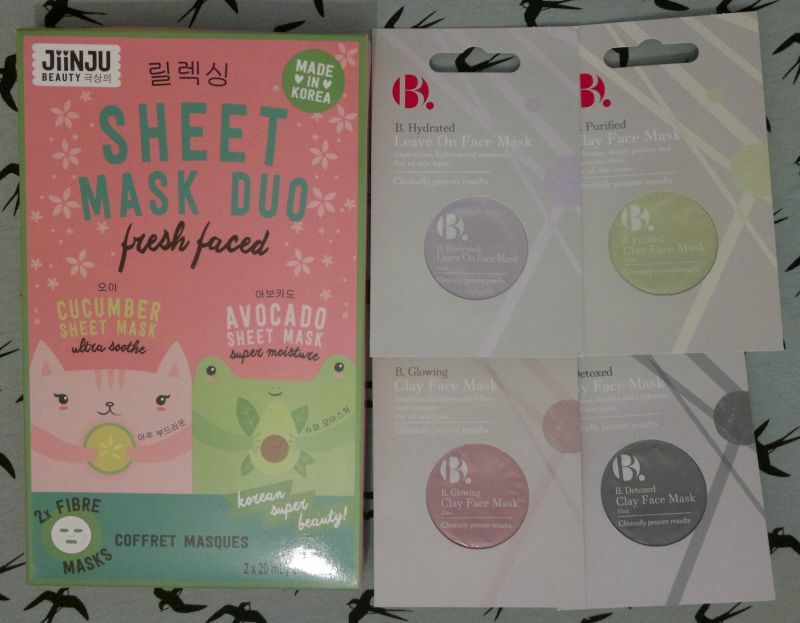 Jiinju Sheet Mask Duo – I got 3 of these sets for free (gift with purchase), B. face masks, £1.45 each. Superdrug. Barry M Molten Metal Holographic nail polishes, these were on special (3 for 2 across all makeup and nails at Superdrug, so I bought 6 items for £4 each and I paid £16 instead of £24). 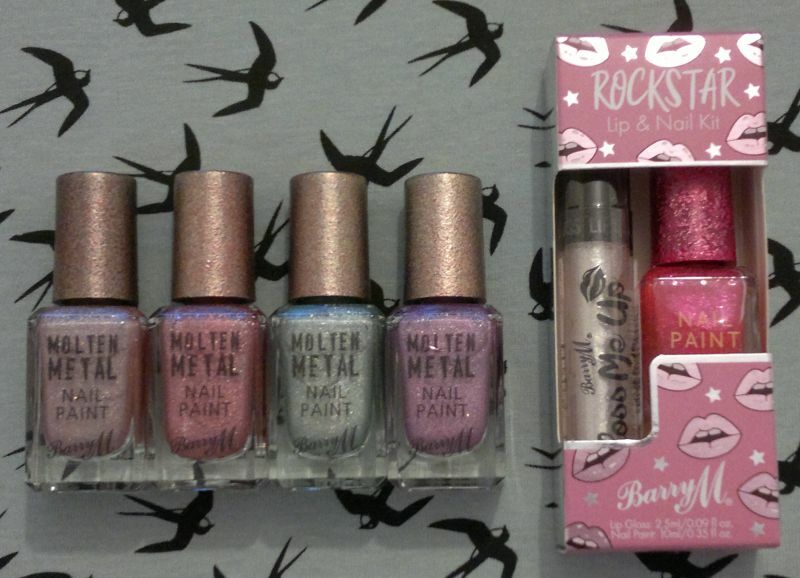 The Barry M Rockstar Lip & Nail Kit was a free gift with purchase. 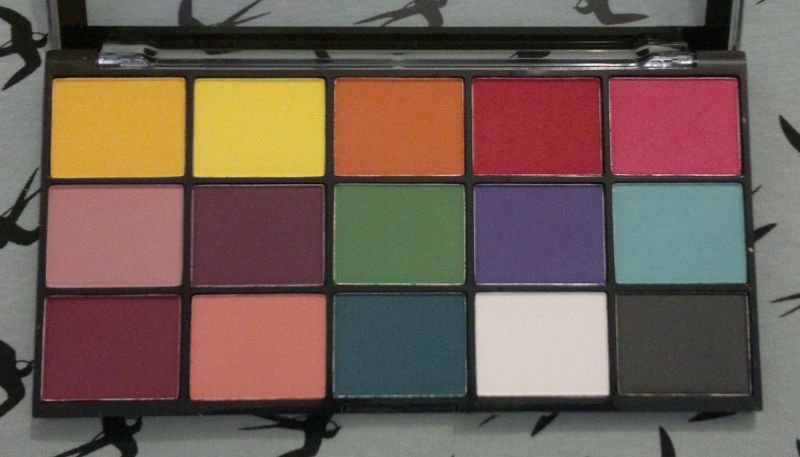 Revolution Reloaded Marvellous Mattes, £4 but 3 for 2. I’m going to use this palette to make more stamping polishes! I bought another eye palette, but I don’t know where I placed it. Oops! 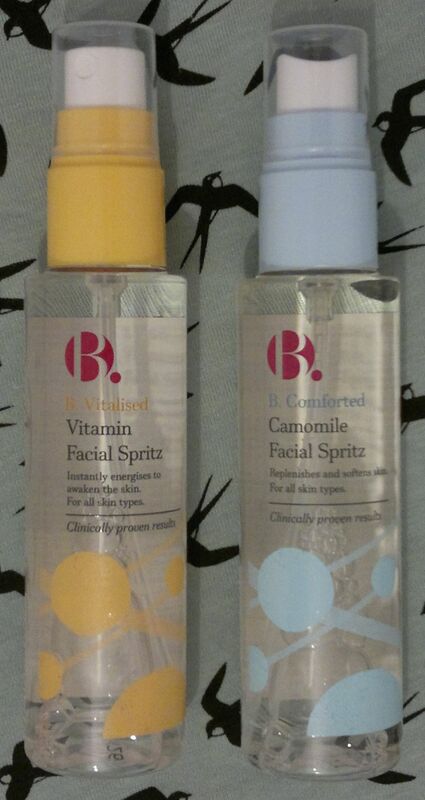 B. Vitalised Vitamin Facial Spritz, B. Comforted Camomile Facial Spritz, £3.89 each (half price offer). Superdrug Naturally Radiant Glycolic Acid Facial Pads, B. 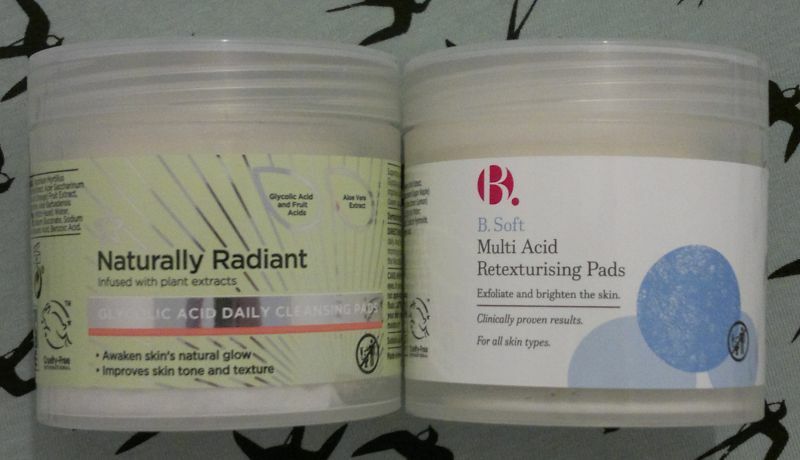 Soft Multi Acid Retexturising Pads, £2.89 each (half price) – these seem to be the exact same product! 🤔 I’ll give them a try and report back! 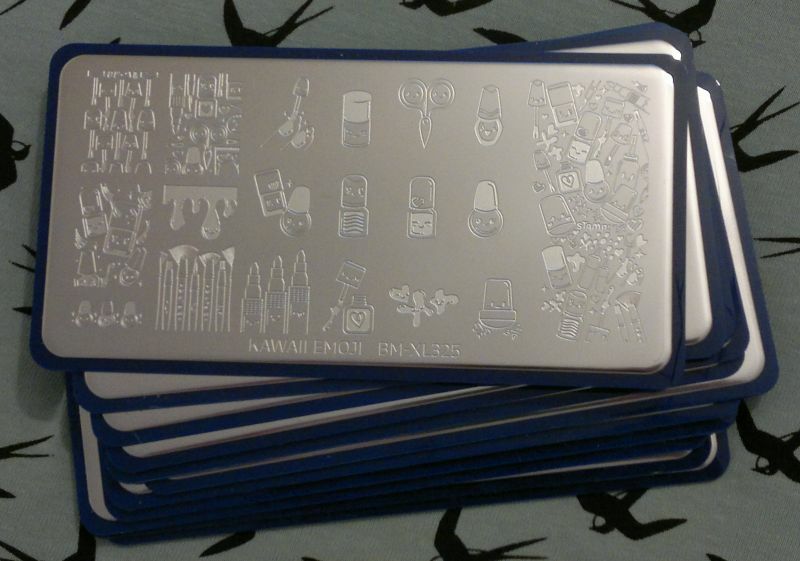 And I bought 11 new Bundle Monster stamping plates, the cheapest plate was £1, the most expensive one was £2.60. Bundle Monster is now Maniology. Either way, I bought these stamping plates from a fantastic online shop – Nail Art UK. I’ve shopped with them before, and I think they provide excellent service! I’m not affiliated with them in any way, I’m just a happy customer. Wow, I bought quite a lot! And I have no excuse really! Any new products you picked up recently? Feel free to get in touch via the comments. And thanks for stopping by! Hi there! 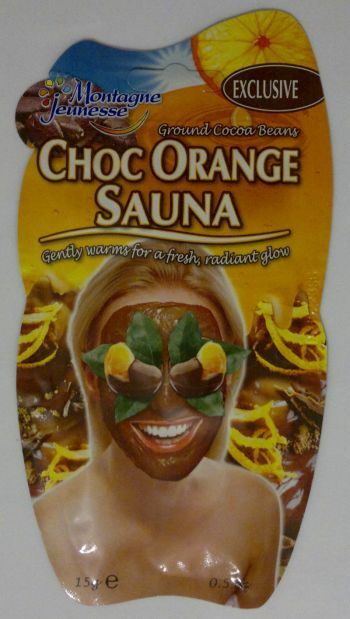 Today’s post is about a face mask I picked up recently – Montagne Jeunesse Choc Orange Sauna. This is a self-heating mask that promises to open pores to give skin a deep cleanse. Montagne Jeunesse recommends you leave it on for 10-15 minutes before washing it off. I’ve now tried this mask, and I’m disappointed. I bought this mask recently, but most of the product had turned into a solid mass inside the sealed sachet. I was able to use some of the product, however, the self-heating effect was non-existent, and the mask didn’t really do anything for my skin at all. The sweet chocolate-orange fragrance was still spot on. But it didn’t matter. All in all, I’m disappointed. I think it’s possible this is old stock. However, I would expect the manufacturer to be aware of the rather limited shelf life of their products, and I would also expect them to print a use by date on such products. Montagne Jeunesse Choc Orange Sauna is available as 15g. I paid 90p. This mask is approved by the Vegetarian Society, and it’s certified cruelty-free (it carries the Leaping Bunny logo). Hi there! 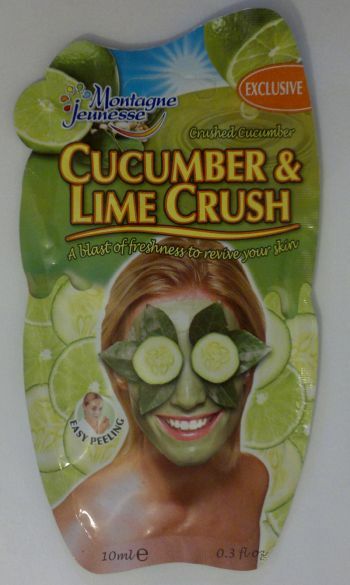 Today’s post is about Montagne Jeunesse‘s Cucumber & Lime Crush Peel Off Face Mask. This face mask promises to lift off dead skin cells and impurities, and to revive skin. It works like any other peel-off mask: Apply it to your face, let it dry for about 15 minutes, and simply peel it off (then wash your face). How’s the mask? I think this is an average face mask. Montagne Jeunesse has done a number of much better peel-off masks, so I don’t know why they keep pushing this one (this is a repackaged version of their cucumber peel-off mask). In addition, this mask smells strongly of alcohol. It’s best to hold your breath when you apply this mask to your nose! Based on my experience, I wouldn’t recommend this face mask. Like I said, there are quite a few great Montagne Jeunesse peel-off masks, but this isn’t one of them. Montagne Jeunesse Cucumber & Lime Crush is available as 10ml for 90p at Primark. This face mask is certified cruelty-free (it carries the Leaping Bunny logo). Hi there! Today’s post is about Montagne Jeunesse‘s Purple Acai Peel Off face mask. This peel-off face mask is like any other peel-off mask. Apply it, let it dry for about 15 minutes, then peel it off, and wash off any residue with warm water. So how’s the mask? I think it’s one of Montagne Jeunesse’s best peel-off masks. I found it very effective, and I think it even brightened my skin. The lovely fragrance is an added bonus! 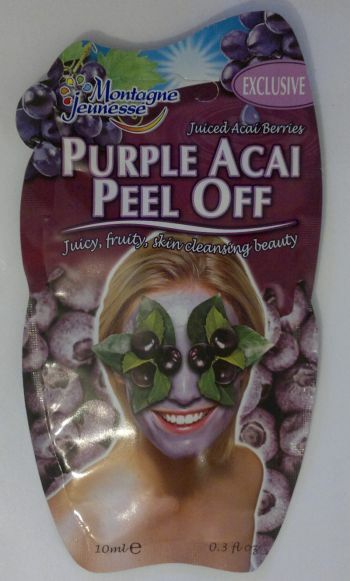 Montagne Jeunesse‘s Purple Acai Peel Off face mask is exclusive to Primark where you can pick it up for 90p. In addition, this face mask carries the Leaping Bunny logo which means it’s certified cruelty-free! Hi there! Today’s post is about Montagne Jeunesse 7th Heaven Red Hot Earth Sauna Masque. I’ve had this mask in my stash for quite a while. And I could kick myself for not trying it sooner! If you’re looking for an effective cleansing mask, I would recommend this one. I think it’s one of the best cleansing masks out there! 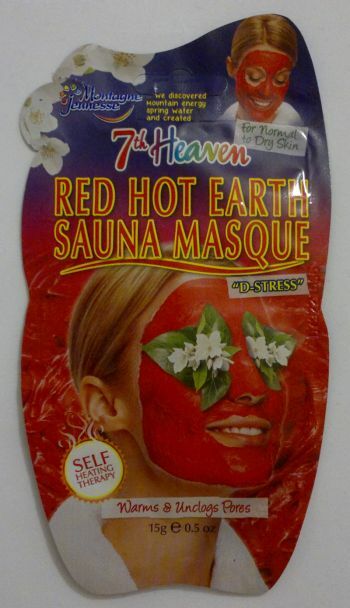 Montagne Jeunesse 7th Heaven Red Hot Earth Sauna Masque is available as 15g for £1. This mask is 100% cruelty-free. It’s BUAV-appoved, and it carries the Leaping Bunny logo! Hi there! Today’s post is about Montagne Jeunesse‘s Sunburst Sauna face mask. This face mask is exclusive to Primark where I picked it up for 90p. Initially I bought 1 mask. 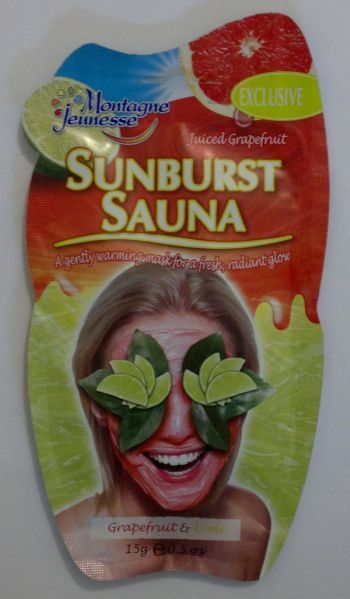 But I went back to the store to buy a few more of these masks because I was hoping this one would be the reincarnation of the incredible Grapefruit Sauna mask which I fell in love with. OK, now here’s what this mask does. This self-heating mask leaves skin feeling sensationally clean and clear. It really is amazing. Nothing else comes close to this mask’s skin cleansing powers. One thing: If you leave the mask on for longer (I usually leave masks on for 30+ minutes), you’ll notice that this mask will make your skin feel dry. However, this mask has never irritated my skin, and the initial post-mask dryness is always completely gone within seconds after applying a normal moisturiser. What else? This mask has the most wonderful grapefruit fragrance – it’s 100% delicious! Montagne Jeunesse‘s Sunburst Sauna face mask is certified cruelty-free, and it’s suitable for vegetarians. It’s approved by BUAV (it carries the Leaping Bunny logo) and by the Vegetarian Society. Hi there! Today’s post is about a face mask that I picked up at my local Poundstretcher store – Montagne Jeunesse 7th Heaven Chocolate Mud Masque. This mask is a clay mask. All you have to do is apply it to your face, leave it on for about 15 to 20 minutes, rinse it off – job done! I’ve only just tried this mask for the first time – and I could kick myself for not trying it sooner! So… you like chocolate? You like clear skin? Well, what are you waiting for?! 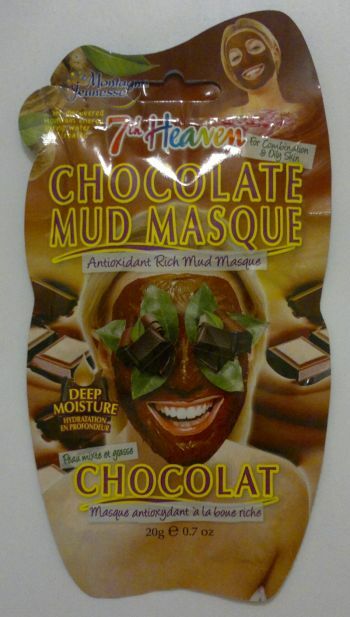 Montagne Jeunesse 7th Heaven Chocolate Mud Masque is available as 20g for £1. This mask is 100% cruelty-free. It’s BUAV-appoved, and it carries the Leaping Bunny logo!